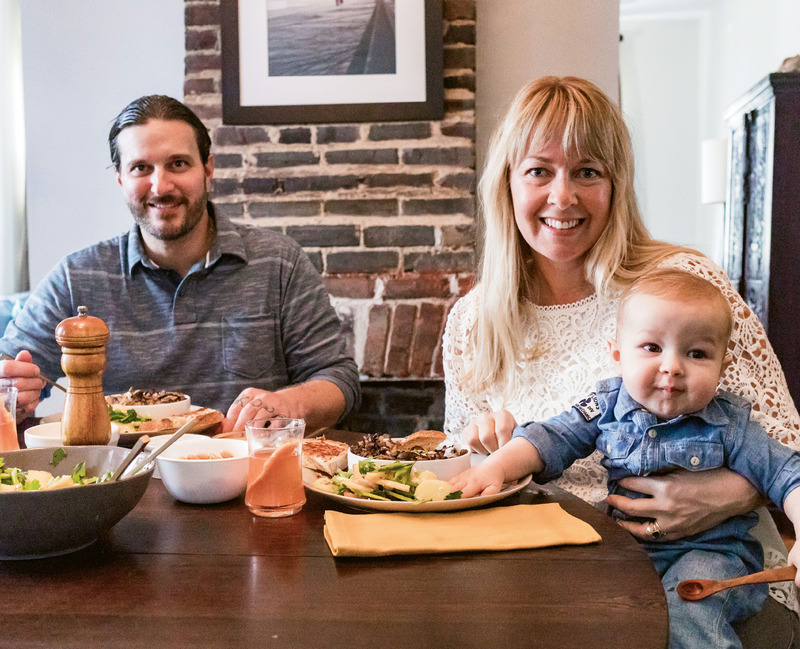 Karalee Nielsen Fallert brunches with her husband, Chris, and son, Harley. 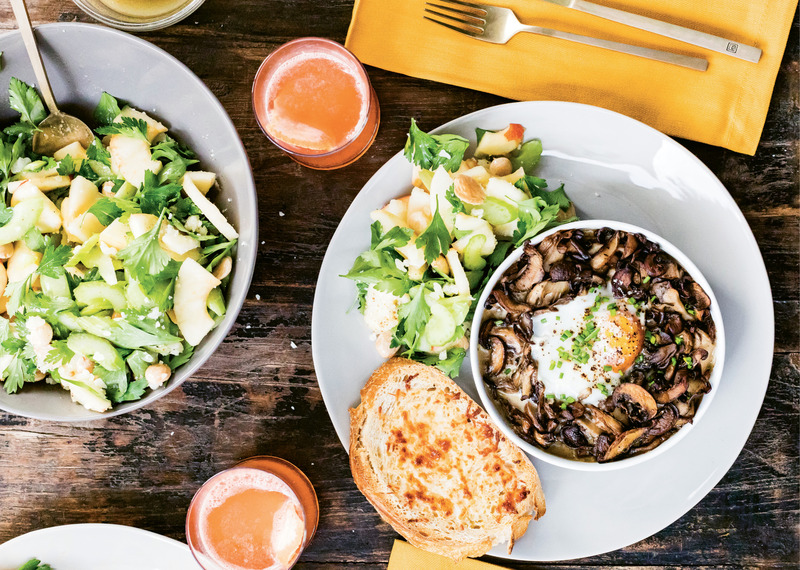 Crusty, cheesy toasts are perfect for dipping into the savory mushroom and egg bake, while a bright apple salad delivers satisfying crunch. 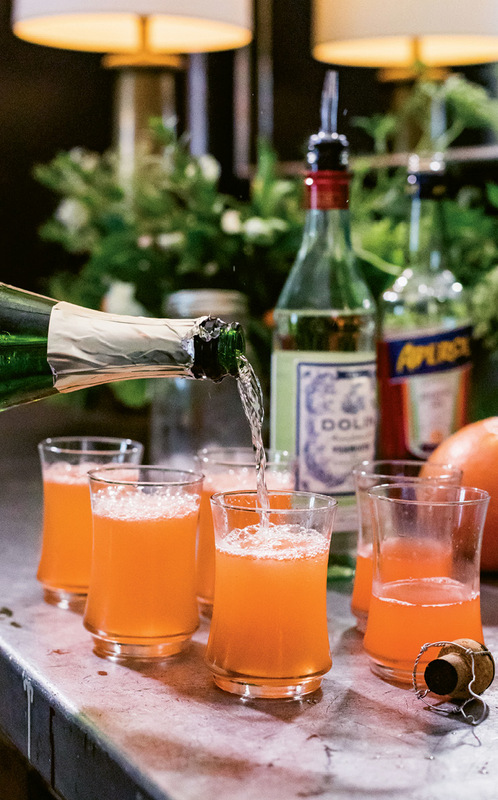 For cocktails, the restaurateur riffs on The Park Cafe’s classic Aperol breakfast beverage, trading orange juice for grapefruit juice. Karalee’s husband, Chris, lends a hand in chopping chives to garnish the baked eggs. 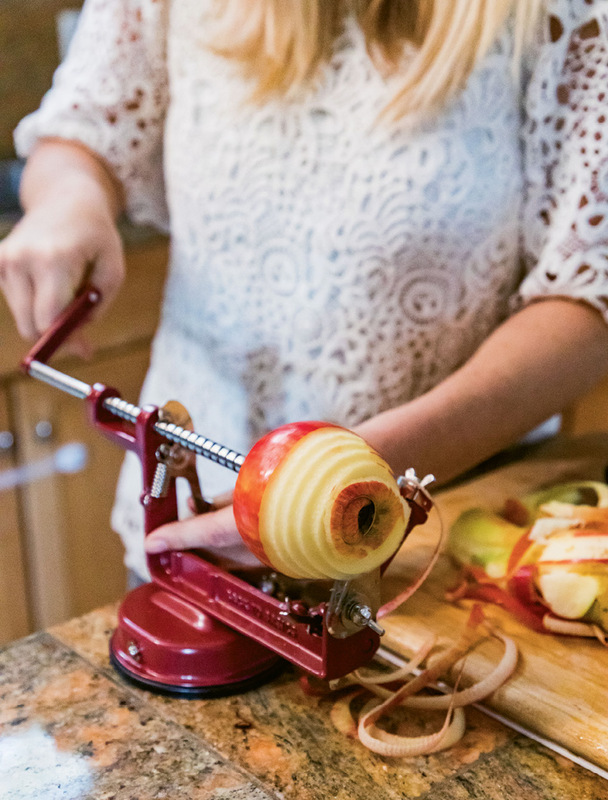 Using a spiralizer can be a secret time saver, as it produces thin apple strips in a snap—but if you don’t have one, slicing the fruit works fine. 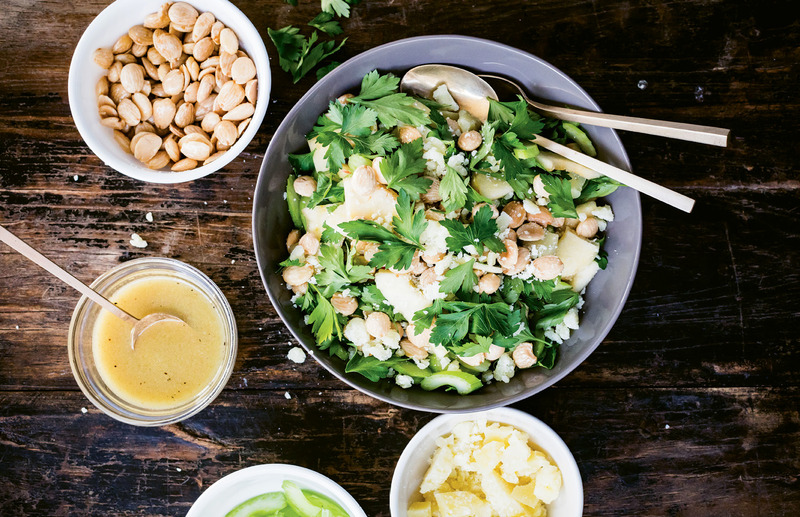 Apples, almonds, and buttery Manchego cheese combine for a simple and sweet brunch salad. The bright grapefruit cocktails get topped off with bubbly. PHOTO: Karalee Nielsen Fallert brunches with her husband, Chris, and son, Harley. When you operate as many restaurants as there are days in the week, your plate remains pretty full. Add the launch of two new dining locations, hours of volunteer service to the urban community and school garden nonprofit The Green Heart Project, construction on an Edisto Island family farm, and a bouncy infant to the mix, and frequent dinners out become necessary. “Still, I crave cooking at home,” says Karalee Nielsen Fallert, co-owner of The Park Cafe, The Royal American, two Taco Boy locations (with more on the way! ), and the soon-to-be-open Wiki Wiki Sandbar, as well as founding partner of Closed for Business, Monza, and Poe’s Tavern. 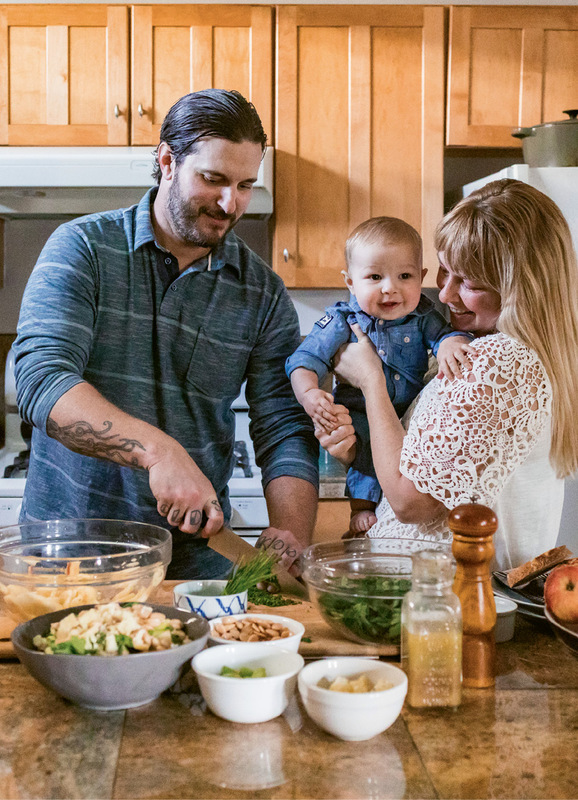 Since she and husband Chris welcomed their son, Harley, 10 months ago, the couple has found that the best opportunity to enjoy homemade meals falls on slow weekend mornings—and so brunch prepared in their own downtown kitchen is often the highlight of Fallert’s full schedule. 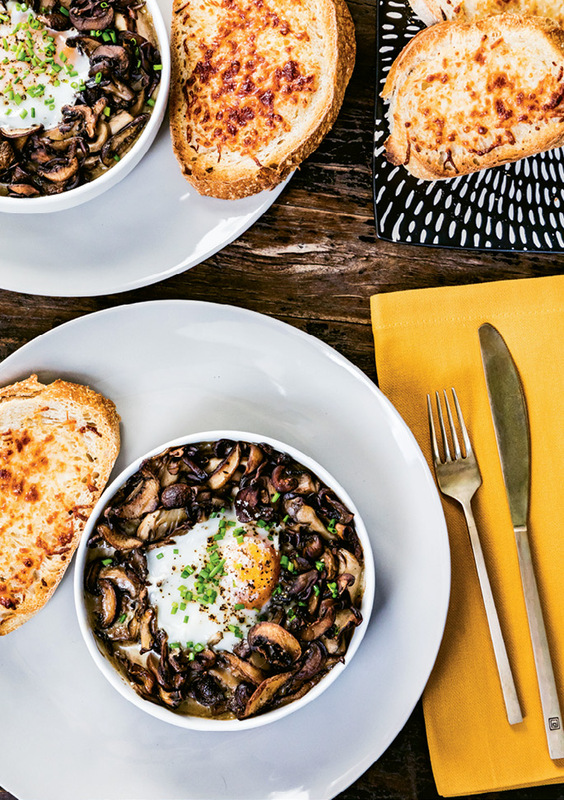 In the same way that she conceptualized all of her unique eateries, the restaurateur developed her main dish—baked eggs with pan-roasted mushrooms—with experimentation and field research. “I’m a mycophile [a person who loves mushrooms] and am obsessed with fungus in general,” says Fallert, who gathers shiitakes, maitakes, lion’s manes, and oyster varieties from the farmers markets in Marion Square and at Pacific Box & Crate. For brunch, she slices a mix of the mushrooms and sautés them in grapeseed oil, which she utilizes for its high smoking temperature and neutral flavor. Once caramelized, the fungi get tossed with crème fraiche to add tangy creaminess to the dish. “The result reminds me of beef stroganoff,” notes the cook. To finish, Fallert creates mushroom nests in individual ramekins and tops them each with a fresh egg from Storey Farms—her favorite free-range chicken farm on John’s Island—before baking. She serves them with Parmesan toasts on the side, a throwback to a satisfying breakfast her mom served when Fallert was a little girl. As a light and crunchy accompaniment, Fallert tosses together a honeycrisp apple salad using produce that’s available in February but offers a peek into spring. 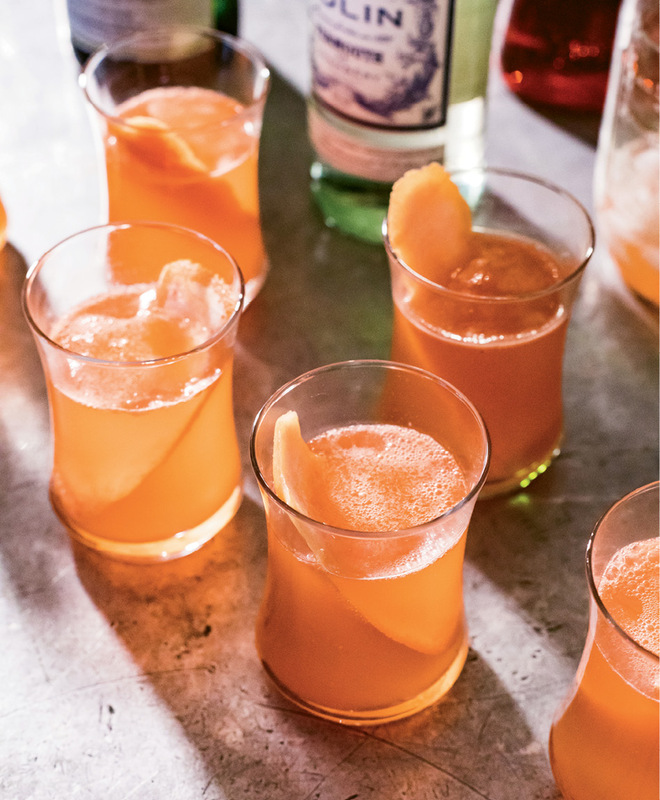 Finally, the restaurateur tweaked an Aperol cocktail from The Park Cafe, swapping in ruby red grapefruit juice for the standard o.j., then adding vermouth and sparkling white wine to the aperitif-citrus mixture—think of it as an up-tempo version of a mimosa.